The world of insurance can be very confusing and at the Monadnock Birth Center we do all we can to provide a clear path to make it as easy as possible for you. We use the services of a company, Birth Billing Specialist (BBS) and its founder, Deanna Smith, to do all of our insurance billing for your care and for our facility. When you first come into care at our Birth Center, you will fill out a registration form with all of your insurance policy information which will be sent to BBS, along with a copy of your insurance card. You don’t need to contact your insurance company yourself – BBS will do that for you. After BBS speaks with Provider Services at your insurance company, you will receive a report about how your company and plan will pay for your care with us. One advantage of Birth Center care, is that if your plan does require you to pay a co-insurance amount, that amount is likely to be significantly less that you would pay for hospital care. Our fees are considerably lower than hospital care, approximately by 20%, which will result in a lower payment for you. Once the BBS report is received, you and the Birth Center will sign a Financial Agreement that reflects the report. If you will owe any out-of-pocket expenses, you will need to pay 75% of these expenses during your pregnancy. We will work out a plan with you to pay these amounts that will work for you and the Birth Center. With maternity care, all of the insurance billing for services is done after your baby is born. Once the billing process is complete and all amounts owed and payments made are reconciled, you will be responsible for any remaining charges, which typically amounts to approximately the remaining 25% of your out-of-pocket expenses. Insurance coverage for care at the Birth Center is the same as with care at the hospital in another way: there are charges for your care with your midwife at the birth center, just as there would be with doctors or midwives at the hospital. There is also a facility fee at both the hospital and at the Birth Center: this fee covers the expenses of maintaining the Birth Center itself, as it does for the maternity unit at the hospital. In addition, there are charges for caring for your newborn at both the hospital and at the Birth Center. All of these charges are addressed for you in the BBS report discussed above. One charge that is not covered with Birth Center care, although it is with hospital care, is the fee for the assistant midwife at your birth. At the present time (2017), this fee is $400. 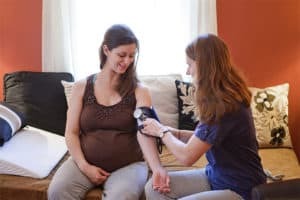 For both your safety and comfort, and in accordance with rules for birth centers in New Hampshire, there are always two midwives in attendance at your birth. 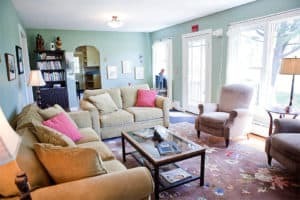 The Monadnock Birth Center engages with midwives to provide this service, but does not employ them – they are independent contractors, and you pay the fee directly to the assistant midwife at the time of your birth. If you do not have insurance, we will do all we can to help you strategize about how to gain insurance coverage. If by some chance, you continue to not have insurance coverage, we are happy to discuss payment plans with you. At the Monadnock Birth Center, we are very pleased to be able to assure you that, in the majority of cases, we will be able to accept your insurance to pay for our services for you and to provide the services of Birth Billing Specialist and Deanna Smith to make the process as easy as possible for you. We look forward to working with you!